The global seed market is highly oligopolistic in nature dominated by companies like Monsanto, DuPont, Syngenta and Bayer to name a few. 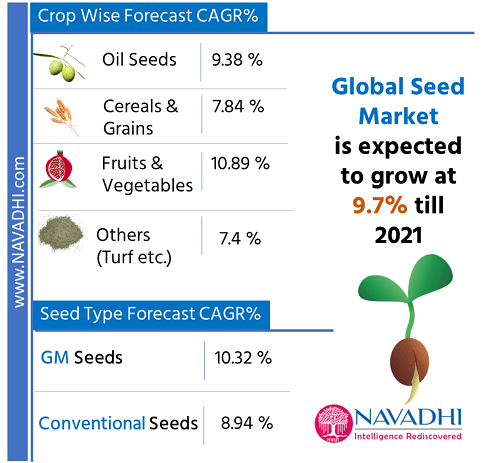 The demand for seeds is on the rise due to global population rise and thus the Seed market is a highly growing one. 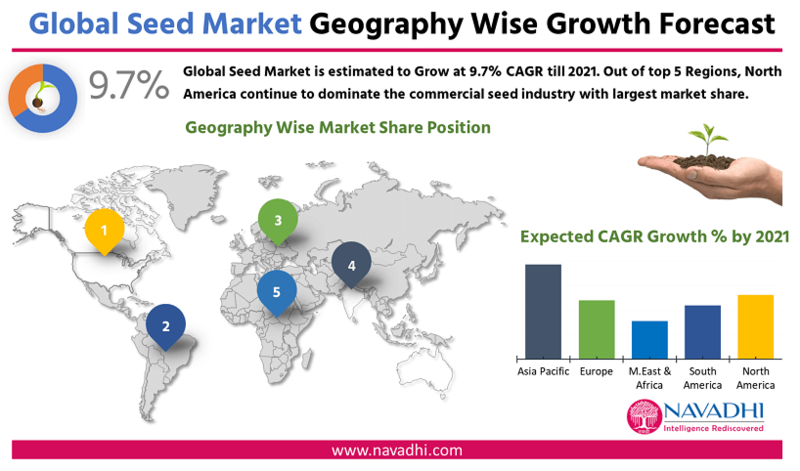 The objective of this research study is to understand the current Seed market across the world and to estimate the growth rate for the next 5 years. The report covers the detailed analysis of 12 companies- their value chain, financial performance and forecast, Business strategy, SWOT analysis which are involved in breeding and production of seeds and having presence across different regions of the world. The details of the company and certifications are also mentioned in this report. The global seed market is to grow at a CAGR of 9.7% by the year 2021. The end users of seed are farmers or anyone who grows it for cultivation. Cereals and grains, oil seeds, fruits and vegetables and other seeds are the major seeds produced in that order globally. Increasing demand for global food production, increase in the use of commercial seeds, increase in the use of GM seeds, development in nonfood seed market, sustainable increase in productivity are some of the key factors which will drive the growth of seed industry. This report provides a detailed view of global seed market with the current market value as well as projections for future market potential and growth rate. This report identifies the need for seed production globally. This report provides detailed information on product wise growth forecasts for Seed market globally by 2021. This report identifies the growth drivers and inhibitors for seed market globally. This study also identifies policies related to Seed market globally. This report identifies various credit, policy and technical risks associated with seed market globally. This report covers in detail the competitive landscape in detail of global seed market. This report identifies the key industry bodies and associations and their role in global seed market. This report provides PESTLE (political, economic, social, technological, legal and environmental) analysis for global seed market.